To date when I’ve needed to do this, I’ve either knit several rows extra of the I-cord “free” prior to beginning to apply it to the edging, or I’ve used a provisional cast-on with waste yarn for wider knit trims. Working several rows of extra I-cord gives me a snip zone I can cut and then ravel back to produce the cast-on edge live loops I need for grafting. 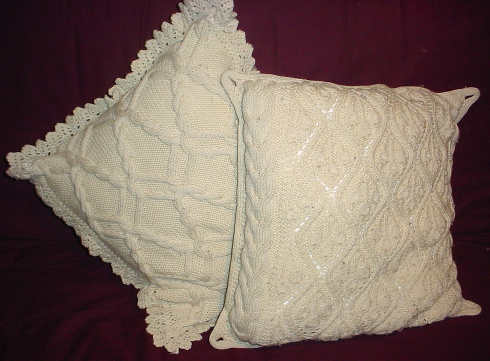 I suppose for narrow trims, I could do a similar thing – knitting several rows of plain garter or stockinette prior to beginning simultaneous application to the thing being trimmed and commencement of my trim pattern. A judicious snip and ravel back will reveal those live loops just as nicely as working sacrificial to-be-cut I-cord does. But I had a “doh!” moment last night. 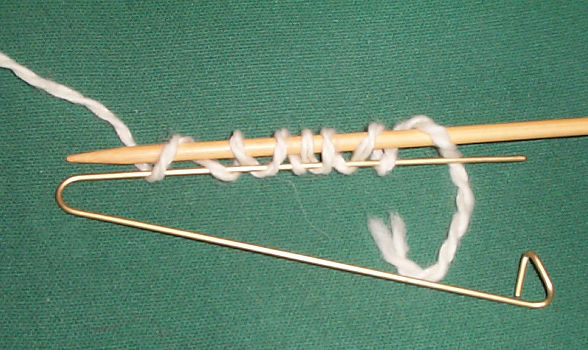 Why not just cast those few first stitches directly onto a large safety pin or small stitch holder? Unclasp, transfer stitches onto a live needle, and go! To do this, I’d use the simplest of provisional cast-ons, starting out by holding my strand behind my stitch holder and picking one stitch up knitwise, then I’d shunt the yarn to the front of the holder and with my needle tip in back of it, pick up one stitch purlwise, and so on. EXCEPT that by picking up the stitches instead of winding the yarn around the needles I’ve managed to mount every other stitch with the leading leg in back. Not a problem. I’d work one corrective row of purls back before beginning my edging, and on that row, I’d purl into that back leading leg to eliminate any inadvertently twisted stitches. Or I could reverse the direction of the stitch holder and wind the yarn on exactly the same way as I do for my fig-8 cast-on, eliminating the problem entirely. You are a bl**dy genius! Why didn’t I think of that? I hate trying to work those sts off the spare thread and onto the needle. Mwa! Mwa!